I settled on the Tammie Norrie design by Scottish boat designer Iain Oughtred. Similar to the Penobscot 14 in style and dimensions, it has a few details such as open gunwales and park bench-type seating that make it a slightly prettier boat. Tammie Norrie uses glued lapstrake construction. The easiest way to understand lapstrake construction is to think of the shingles on a roof: Each shingle overlaps the previous one a little bit. In the 9th century, Viking ships were built using the lapstrake method. Traditional lapstrake construction requires using many frames to support the hull planking. When properly built, these boats are beautiful; however, many amateur boat builders steered away from traditional lapstrake construction. In the 1980s, small craft designers started working with glued lapstrake construction. By making the planks out of marine-grade plywood instead of lumber and gluing them together with epoxy, builders could construct a lapstrake hull while eliminating much of the interior structure. Tammie Norrie has a backbone consisting of a stem, keel, and transom, but no frames. 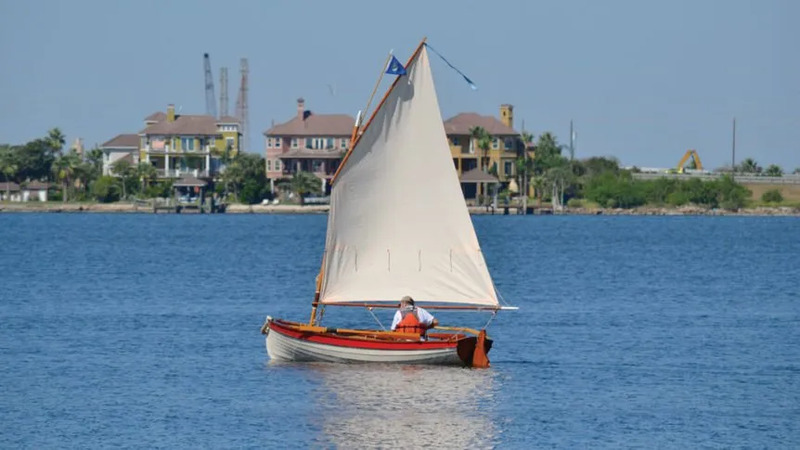 This type of construction has two key advantages: It’s within reach of amateur boat builders (provided they employ the appropriate amount of patience), and it allows the amateur to construct boats that resemble classics from the late 1800s, such as Whitehalls, Rangeleys and Melonseeds. Although you can buy Tammie Norrie kits, I chose to work from plans, which included full-size paper templates for the stem, transom and molds. Paper templates have received a bad reputation over the years; sometimes the printing machine distorts the plans, and paper is subject to changes in temperature and humidity. Fortunately, the plans also included a table of offsets, so the first thing I did was build a lofting table 4 feet wide and 16 feet long and lofted the boat full size. This enabled me to lay out the patterns for the parts I needed, which were then traced onto sheets of Mylar. Next, I disassembled the lofting table and used it to make the molds. You build the boat upside-down, so I constructed a plywood box as a work platform. The molds were mounted on the box at the intervals specified in the plans, and the boat built over the molds. With the molds and the backbone set in place, I ripped a bunch of long strips to line off the planks. Lining off serves two purposes: It verifies the molds are correct (the strips will show a bump or a wiggle if they’re out of shape), and it establishes or verifies the position of the planks. Tick marks on the paper templates indicate where the planks should go, so in this case, I transferred the tick marks to the molds, laid the strip along the marks, and adjusted as necessary to ensure a nice smooth curve at each plank. Once satisfied with the lining off, I hung the strakes. Tammie Norrie has eight strakes per side. Because plywood only comes in 8-foot lengths and the boat is 13 feet 6 inches long, each strake has a forward and aft plank joined by a scarf. Each plank is beveled with a 1:8 slope. The strakes don’t have a constant width. They tend to be a little wider amidships and narrower at the ends. They’re also not straight but have something of a C-shape, and all are shaped differently. Ideally, the port side of strake 3 should be the mirror image of starboard strake 3, but strake 3 is shaped differently than strake 4. The process of determining the shape of the strakes is called “spiling.” The spiling methods I found in traditional boat building books all seemed to require a little bit of black magic and voodoo. I found a simpler method online. I laid the long strips I used for lining off at the top and bottom edge of the strake and connected them using small scraps, in effect building a truss, or pattern, for each strake. I could then lay the pattern on the planking stock and trace an accurate plank. I continued the process, first hanging a strake on one side, hanging its mirror image on the opposite side, and then hanging the next set of strakes. After hanging all the strakes, I installed the outer stem and keel. Next, I sealed the hull with two coats of thin epoxy before priming and painting. Then it was turnover day! With the boat turned over, you need to strengthen the hull. This includes adding the floor timbers, breasthook, quarter knees and inwales. In boat building, there are only two kinds of lumber: “not cheap” and “very expensive.” Not cheap lumber is what you buy at the local big-box store. It’s good for making patterns and templates. Very expensive wood comes from specialty lumber dealers. First, I made a temporary piece out of not cheap wood to ensure I had the dimensions and angles correct; after I was satisfied with the temporary piece, I cut out the final part out of very expensive wood. Once the hull was strengthened, I started fitting out the interior. Fitting out includes adding the floorboards, centerboard case, thwarts, thwart knees, stern sheet, bow seat, and side benches. I carried the same process of making temporary pieces first through the fitting out stage. As a traditionally styled boat, Tammie Norrie should have traditional fittings where possible. Wee Lass had rope-stropped wooden blocks, and they worked well, so Tammie Norrie got its own set. I made the shells from cherry to match the rest of the boat’s trim, and I made the strops from Hempex, a synthetic faux-hemp. Tammie Norrie also got a nice set of rope fenders. Wee Lass’s rope fenders were really too small to be useful, but the fenders on Tammie Norrie are a different style and larger. When I finally got ready to launch my new boat, I had to wait for a decent weekend. I had started lofting on Feb. 15, 2015, and launched the Sandra Catherine on Oct. 27, 2018. With glass-smooth water and not a puff of wind, the first trip was under oars. Later in the afternoon, a small breeze picked up, so we rigged the boat for sail and ghosted along for a little while. Al Meyer belongs to Houston Sail & Power Squadron/21. He serves as a Vessel Check Examiner and instructor for America’s Boating Course and Seamanship. He prefers small, traditionally styled sailboats. This is the fourth boat he’s built. A detailed construction blog of building Sandra Catherine can be found at alsboatsdotcom.wordpress.com. This article first appeared in the squadron newsletter, Bay Neigh.